Common names include Toothache Plant, spilanthes acmella, Para cress, Akarkar, Pipulka, Pipulka, Akarkara, Hemmugalu, Pirazha. It is grown as an ornamental and it is used as a medicinal remedy in various parts of the world. Acmella oleracea (syn. 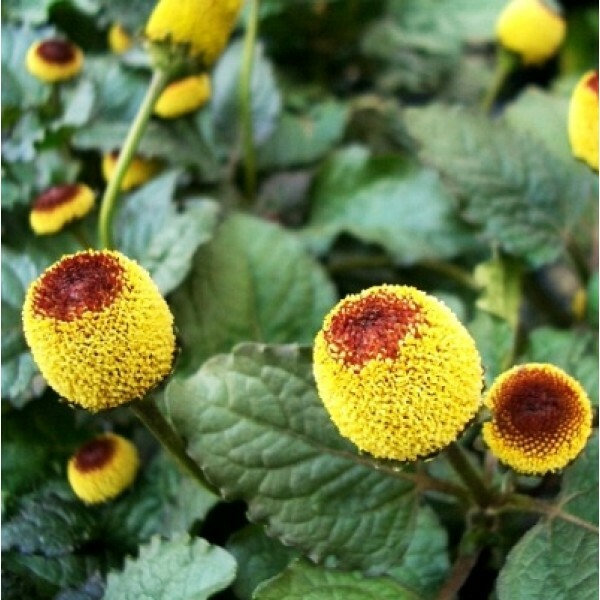 Spilanthes oleracea, S. acmella) is a species of flowering herb in the family Asteraceae. It is grown as an ornamental and it is used as a medicinal remedy in various parts of the world. A small, erect plant, it grows quickly and bears gold and red inflorescences. It is frost-sensitive but perennial in warmer climates. Small amounts of shredded fresh leaves are said to add a unique flavour to salads. Cooked leaves lose their strong flavour and may be used as leafy greens. Both fresh and cooked leaves are used in dishes such as stews in northern Brazil, especially in the state of Pará. They are combined with chilis and garlic to add flavor and vitamins to other foods. The leaves and flower heads contain analgesic, antifungal, anthelminthic, and antibacterial agents, but some of the compounds are destroyed by desiccation or freezing. Flowers and leaves are useful in this plant.